“There are many adventures to be had here, my lady!” proclaims the short-bearded gentry dressed in a high standing collar and baggy short trousers. He represents the send-off party for King James 1st bidding farewell to 104 brave soldiers including Captain John Smith - all destined for the New World. 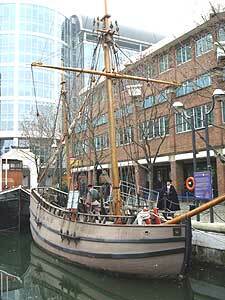 Having just watched Terrence Malick’s “The New World,” it feels oddly surreal to be standing in Canary Wharf, London for the mock-launch of the replica Discovery, the smallest of the three ships that set sail that day for Virginia. The other two were the Susan Constantine and the Godspeed. About a dozen actors dressed in Elizabethan costumes reenact preparations by climbing high into the sail towers and stocking provisions in the hull. One of these actors is Captain John Smith and I’m desperate for an interview. The ship is wedged in a port surrounded by glass high-rises and modern conveniences. The clash of cultures is buffeted by a patriotic fife and drum procession that helps sustain the illusion of the year 1606. This May 13th, 2007 marks the 400th anniversary observance of the 1607 founding of Jamestown, Virginia, America's first permanent English settlement. Both sides of the Atlantic have been busy commemorating the occasion with re-enactments, special tours and even a complete website to trace your British roots. I’m aboard the Discovery, a tattered ship no bigger than the yellow school bus parked across from it. Claustrophobia is closing in fast while I'm filming from underneath the ships floorboards. It’s dark and dreary and smells musty. It’s easy to see how the voyage was plagued with difficulties from food shortages to disease to tensions that came close to capsizing the entire journey. But, somehow all 104 men and boys survived the five-month trip and rushed ashore to be greeted by a generous tribe of Algonquin Indians. Had it not been for the early generosity of the natives and Captain John Smith’s heroics, odds are all the soldiers would have perished that first brutal winter. "Journey to the New World"
British dignitaries, ancestral experts and even Virginia’s governor board the replica to offer insight into the importance of both parties' contributions. At the adjoining Docklands Museum the curator walks us through exhibits that help explain the religious and economic reasons for embarking on a journey fraught with peril. The permanent exhibition is titled “Journey to the New World” and offers glimpses into the daily life of the settlers including maps, charts and maritime instruments. 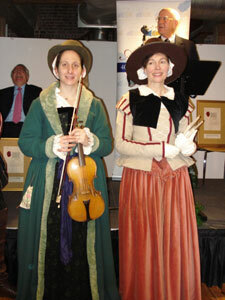 Later that evening the party continues with a formal banquet in the Great Hall of the Middle Temple, built in 1573. With military-style seating, a high crossbeam ceiling and a feast set for a king, it reminds me of a scene from a Harry Potter movie. Each guest (there are about 200 of us) is assigned their own personal server that choreographs movements (refilling coffee, removing plates, bringing out dessert) with other servers. It’s mesmerizing to watch and I wonder – might this be how King James’s nobililty was accustomed to dining in 1606? Learning about the birth of a nation naturally includes a surplus of stories about perseverance and triumph. And since my only reference to Captain John Smith is a sappy storyline with a celebrity actor who survives captivity when a young Indian girl named Pocahontas protects him from decapitation, it’s time to delve deeper. Part of the magic of tracing someone’s roots is finding a guide passionate and articulate about history. Blue Badge Guide Jean Howard is an authority on the younger years of Smith, a sea captain who was also a member of the Council of Virginia and Admiral of New England. It’s believed the Captain’s early years in small sheltered communities helped foster his yearning for exploration and travel. As soon as he turned 16, he sought military adventures through Europe, Russia, the Mediterranean and Northern Africa. We’re visiting the rural English countryside in the rolling hills and valleys of Lincolnshire, two hours by train north of London. There are several towns to see (Willoughby, Alford, Louth and Spilsby) so time is of the essence and Howard rushes me through a busy itinerary. 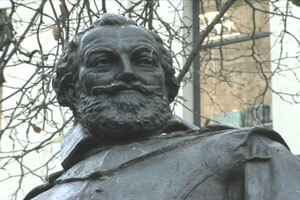 “Louth is the town where the Captain would have attended grammar school in 1585,” says Howard. She admits that he was probably not the world’s most obedient school boy. “In fact, I’m quite certain that he had a will and a mind of his own and would have been a rebellious student,” smiles Howard. I gathered that much from Malick’s movie a few days earlier. Unfortunately, the school is in session so we instead hurry into St. James Church where the faithful are gathering for morning mass. 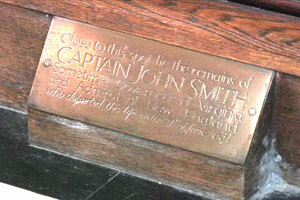 This engraving marks the spot where Smith was buried. “This is where Smith would have prayed,” whispers Howard. Recent restoration projects removed dark stain from the ceiling beams and stripped it to its natural look allowing copious amounts of light to flood in. 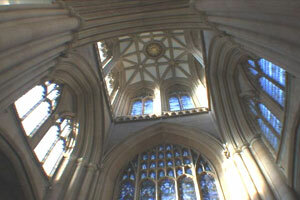 Behind us a choir is practicing under the highest church spire in the country, circa 1515. Melodious hymns provoke the hairs on the back of my neck to stand straight up. The tall hallow chamber boasts the perfect combination of acoustics and for a few minutes I listen in wonder. Might Smith have been as moved by the harmony as I am? It’s certainly uplifting, full of energy, and fills me with positive emotion. Creamy white flowers pop through the frost-covered cemetery grounds of Willoughby St. Helena Church. I tiptoe around them but Howard assures me that the wild plants, called Snowdrops, are hearty and plentiful. Smith was baptized in the small stone font at St. Helena lit by several stained-glass windows. The font is preserved as it was 400 years ago. Today the windows are etched with a storyboard of Smith’s life, including his killing three Turkish warriors in single combat and a portrait of Princess Pochohontas. Next up is Tattershall Castle where John Smith learned the art of horsemanship and jousting. This red brick medieval castle is popular today for fairytale wedding ceremonies from April through October. It’s not open to the public in the winter but the 100 foot tower with an exterior double moat and brick vaulting stands impressive enough. We follow the battlement walkway to the back of the castle where crooked headstones half buried in the wet fenlands shine like mirrors in the sun. Before us is a non-descript view of the fenlands and the faint smell of when horses raced back and forth. Faster than you can say "The Sport of Kings” my pursuit of Captain John Smith’s life comes to close at his final resting place in London. St. Sepulchre-without-Newgate on Giltspur Street is the largest church in the City of London. But that the Truth is held in more esteem." A 400th anniversary rarely makes an appearance in America. Do it up right by encouraging your own Captain-like adventures starting in Lincolnshire and London and culminating in Jamestown, Virginia. This time around far more creature comforts await you in both areas than our ancestors experienced in 1607. Sonja Stark is a freelance videographer/editor/travel writer, founder of Pilotgirl Productions and a GoNOMAD Staff writer.